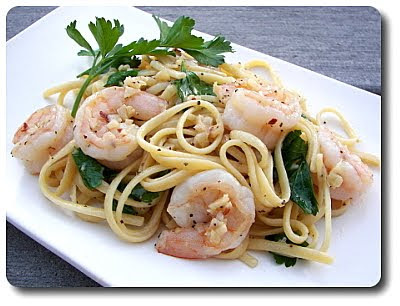 The other night for dinner, we made this Linguine with Shrimp and White Wine dish - this is one of those recipes that could easily scale down to one serving, or double what we did and come up with a meal for four. 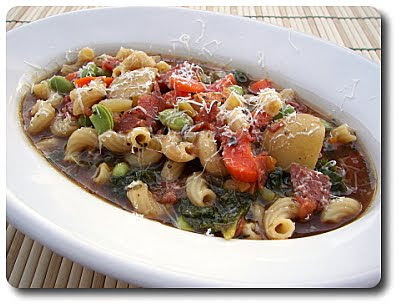 Because I had ideas for the next days lunch, I only wanted to prepare a dish that left us with two servings. Just as the salted water came up to a boil for the pasta, I had another skillet right next to it melting a couple pats worth of butter. Once the quarter pound of pasta was dropped, we slid minced garlic and a generous pinch of crushed red pepper into the pool of butter and waited for their pungent fragrance to release. Turning up the heat to get the action started, the skillet was ready for a couple glugs from a bottle of dry white wine. Giving it a couple minutes to bubble away, the wine concentrated down by a third and was ready for the next ingredient - shrimp! Now, you know I'm not the biggest seafood fan, but I'm still plugging away on broadening my horizons (though I think I'm at a point where I should stop saying that because I've warmed up to it quite a bit) and besides, Jeff loves his shrimp! Seasoned judiciously with salt and fresh ground black pepper, a touch of fresh lemon juice and a bit of cold butter was swirled in to finish this off with a sharp richness. The cooked pasta was tossed in to coat, then we divvied the skillet between two plates and topped each off with a bit of chopped fresh parsley. 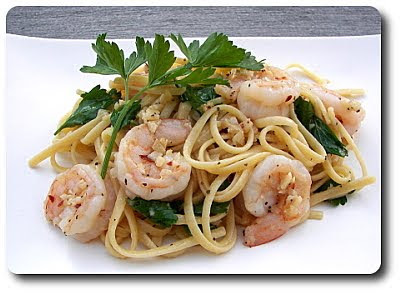 With a pleasant, slight burn from the crushed red pepper, there really isn't much more to say other than we found this to be such a simple and clean meal that it didn't take us long for the noodles and succulent shrimp to vanish off our plates. Besides the few minutes of prep to get the ingredients together and water to a boil, this zippy shrimp dish was practically ready by the time the pasta timer went off - bonus points on that alone! I remembered another dish I have to share that we made before we went on vacation - it was more out of necessity, though, because I couldn't let the tomatoes go to waste outside! 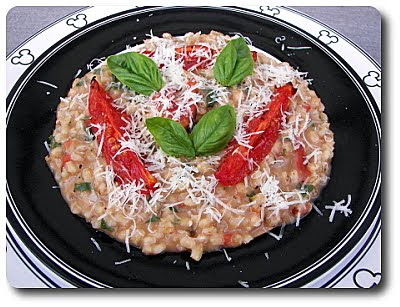 When I went out to the plants, I found I just barely had enough ripe Roma tomatoes we needed for this Barley and Roasted Tomato Risotto, but I did notice there were plenty of green ones still that were just beginning to turn. Thankfully, we had a few friends who stopped by and grabbed the rest when they were up to snuff so they didn't sit and rot! After taking the tough skins off the Romas (which I know isn't the most fun job in the world), each one was sliced into wedges, then drizzled with good olive oil and simply seasoned with salt and fresh ground black pepper. You don't need a bowl for this - lump the tomatoes together, then dig right in with your hands to gently toss them around, allowing each edge to get a piece of the oil action. To allow the tomatoes to cook evenly, just be sure to then arrange the wedges in a single layer on the sheet. Roasted until they shrivel and begin to brown, concentrating them down into sweet, dark ruby strips, take a few of them and set them aside. No, you didn't do all that work for just a garnish as most of them will go into the risotto, but a few draped on top of each is a nice way to gussy up the servings and to clue your guests into what they're about to enjoy! For the base of this dish, shallots took charge by being softened in a bit of oil, followed closely by pearl barley that was tossed into the pan to start toasting. To give the grain a chance to soak in an acidic note before we start ladling in warmed broth, we added a couple shots worth of white wine and gave it a minute or two to absorb. If you've never used barley before, I wanted to note that you check out the total cooking time once you start working with the broth for this risotto. 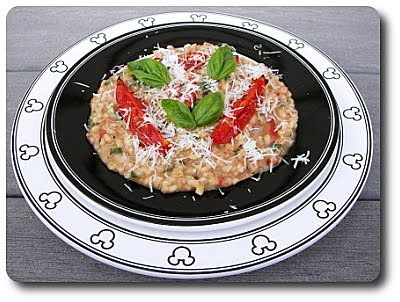 Unlike arborio rice, which ends up taking about 20 minutes or so, you will need to set aside a good 45 minutes or so to give the grain enough time to soften. Plenty of broth (which happens to be vegetable in our case this evening) and a work-out worthy stint of stirring later, once you have worked in the liquid and pulled out some of the starch in the grain, this plain-looking dish was given a face lift by adding the roasted tomatoes, along with fresh basil, thyme, parsley and enough Parmesan for a sharp finish. We added the reserved tomato strips on top, along with a few small basil leaves and a touch of extra cheese just before serving. Now, you won't get as creamy of a result like you do when using rice, but with the barley ending up plump and chewy, making for quite the hearty, textural dish, all we could do was smile at each other as we were all too busy eating to comment! 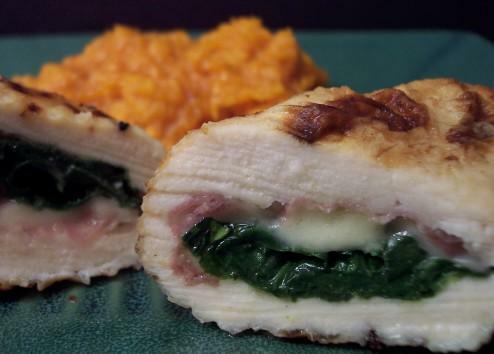 While this was nothing new, our guests and I found the combination exciting, very nutritious and just different enough that we were a little sad there wouldn't be any leftovers for the next day! 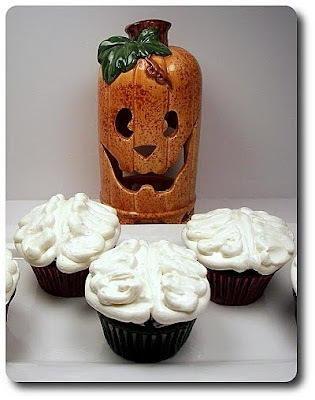 Jeff came to me this weekend with a Halloween-themed idea for the Weekly Wednesday Treat Day that he saw on Martha's website. Since Halloween falls on a Saturday this year, he wanted to bring in a themed treat a few days early, which is why you see these Brain Cupcakes here today (you may need to use a little imagination here...)! We did use a different cupcake and frosting recipe than what was attached on their website, but the basic idea is what's important! For the cupcake, I went with the dark and chocolate-y recipe we used when we did that cupcake bar back in March. We opted for this one mainly because it was simple, tried-and-true and even better than that, used pantry ingredients we always have in stock! 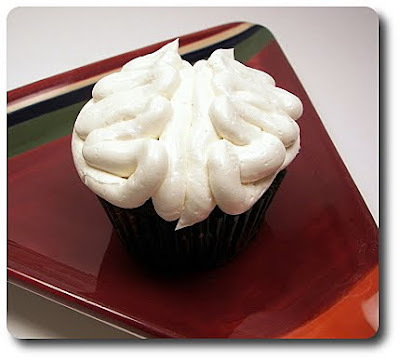 The frosting recipe is a basic Swiss Meringue Buttercream, flavored with a few dashes of vanilla. This type of frosting can be a little fussy, but the silky texture and taste is outrageously good. 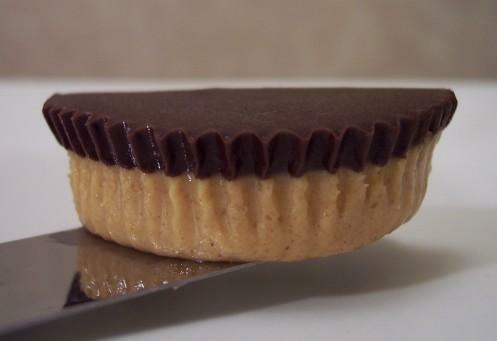 It also has the benefit of not being as super-sweet as some buttercreams can be, which we thought would match well with the dark cupcakes underneath. The one tip with this type of buttercream is not to freak out if it looks curdled and sloppy once the butter starts to go in - just keep beating and you'll see it transform right before your eyes. When the frosting is completely smooth and combined, run the mixer on low for a few minutes - this helps to run out those annoying air bubbles that pop up. 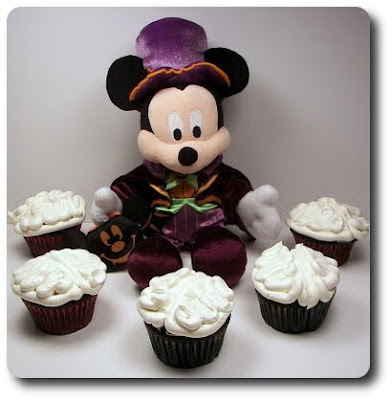 As the cupcakes don't have tall crowns to them, to give the "brains" some dimension, build up a small mound in the center with the frosting, then use that as your base to trace around. The best way to describe what we did is this - look at the top of the frosting mound and imagine the two halves of the brain. Pipe a straight line, slightly off-center, from the top to the bottom - follow that back up around the edge of the cupcake rim to meet back at the point you started. When you hit that spot, fill in that outlined half with back-and-forth squiggles and repeat on the other side. 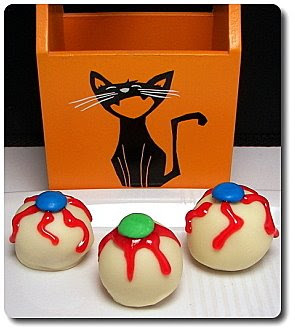 If you wanted to take this farther, try tinting the frosting a gruesome color, or stripe the inside of your pipping bag with a bit of red food coloring for a bloody brain. While this did take quite some time from start to finish as I baked a full batch of twenty four cupcakes, it was fun to do and hopefully not something they expect to see tomorrow! Oh... and apparently someone thought his Halloween Mickey he picked up during our Disney trip had to make an appearance - I'm surprised he didn't slip this in sooner! After that last mushroom incident where Jeff was being a little rascal, I was more determined that ever to see what else I could manage to slip that fungi without him causing a ruckus. Thankfully, I was able to get to the market today, without said helper, to grab what I needed to make this Turkey Meatloaf with Smoked Gouda and Mushrooms for dinner. I might be fighting a losing battle, though Jeff has eaten mushrooms a few times now and did enjoy the meal, but for some reason he is being stubborn. I can be just as stubborn though, so maybe he'll change his tune eventually... he did with tofu! What I thought might pass the muster with this recipe was how the cremini mushrooms where prepared - instead of just lightly sautéing them, the slices were left alone in the pan, being stirred only once or twice, until both sides had seared to a rich, golden brown color. While they won't turn crispy, which would probably solve Jeff's texture issue, I thought the development of flavor that happens would draw him in and show that they don't have to be flavorless sponges (his words!). After doing a couple batches of the shrooms, I kept them aside in a bowl while I used the same skillet to soften thinly sliced leeks and three cloves worth of minced garlic. Scooped into the bowl with the mushrooms, I let the vegetables cool down, allowing me to stir in the shredded smoked Gouda, cubed day-old bread, an egg and tablespoon of chopped fresh sage. 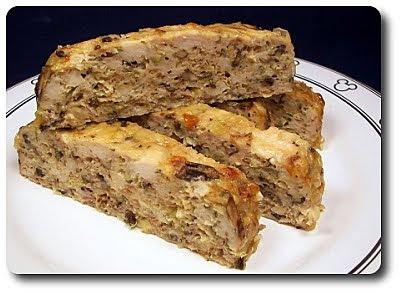 As we were using turkey in this meatloaf, I used a combination of light and dark that I coarsely ground - if you're using a purchased kind, aim for one that is labeled 93% lean as that little bit of extra fat does wonders to keep this moist. You could get away with all ground turkey breast if you must, but I do recommend the mix. Instead of using a pan to cook this in, all we did was place the mixture onto a parchment-lined baking pan and free-formed it into a large loaf. Just as you would if you were cooking a whole piece of meat, you'll want to let this loaf rest once it has baked so all the juice inside doesn't drain out before it has a chance to redistribute. The original recipe called for using a milder fontina cheese, which is option if you already have some in the refrigerator. However, I was looking for a more assertive, robust flavor to keep Jeff interested, which is why I went with the smoked Gouda. I already had a feeling I was going to enjoy my dinner, but I was way more interested to find out Jeff's opinion as I didn't grind down the mushrooms or anything (conveniently he wasn't home while I was preparing it!) - and they were quite visible in the slices. Before I handed him his plate, I did take a forkful and asked him to taste it and check for seasoning (he said later he didn't even think twice because I told him it was just meatloaf after all)... he mentioned an smoky, earthy flavor that struck him right away, but then said it was quite good! He took his plate, sat down to eat and that's when the picking started to figure out what was in it. Yes, a groan that was loud enough to hear around the world, was bellowed out and followed by "Mushrooms! Nooo! You did it again!". 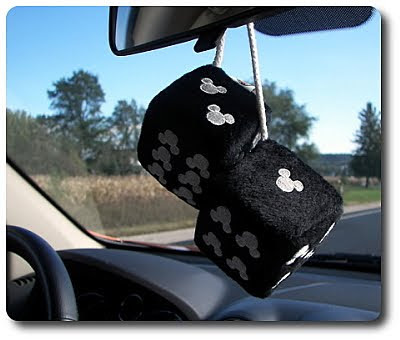 I figured he was going to pull out the pieces he could see, but, you know what? He kept eating and went back for an extra slice! Yeah! I know we just made a batch of peanut butter cookies a few weeks ago, but we quickly demolished those and since I couldn't help myself this morning, I made more cookies with peanut butter. 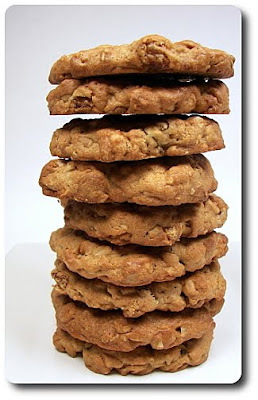 Besides the size between the two, there are quite a few differences between those cookies and the Double Oat and Peanut Butter Cookies I prepared today! With butter and creamy peanut butter being whipped together for a perfect marriage, we sweetened the combo with an even ratio of granulated sugar and brown sugar - this gave us a level playing field for texture, playing between crispiness from the granulated and moist chewiness from the molasses-backed brown sugar. Egg, water and a generous splash of vanilla later, the mixture was ready for the dry ingredients - all-purpose flour, old-fashioned rolled oats and a little baking soda for spread. Check one for oats, but where does the "double" come in? 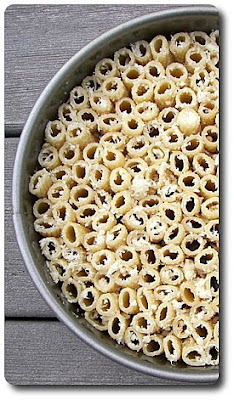 From toasted oat rounds, of course (yeah, I just used Cheerios!). A handful of golden raisins followed the cereal, along with a half cup of peanut butter chips to echo the peanut butter already in the dough. You can play around with that if you like - use dark raisins and chocolate chips, or just entirely raisins or chips if you like. Just try and keep the total to around a cup. Not only are they big because they are stuffed with add-ins, but I also dropped the dough onto the baking sheets using a quarter cup scoop! A couple tips here - these do need some help to bake, so you'll want to level them by flattening the dough balls with moisten palms (this will keep it from sticking). Also, give the cookies plenty of room between them - I spaced them roughly 3" per apart. Even though they are of decent size, it won't take them long to bake - you'll want to whisk them out of the oven when the edges have taken on a light golden hue. However, don't try and move them right away - leave the thick cookies on the baking sheet to set and cool for a few minutes first. 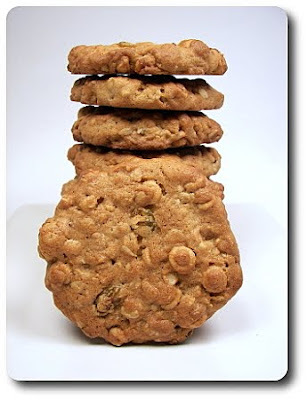 Besides adding a great chunky texture, the cereal stretched the dough out to give you hearty cookies that are fairly large, but not necessarily too heavy in the calorie department. Forgive the title... I just couldn't help myself! 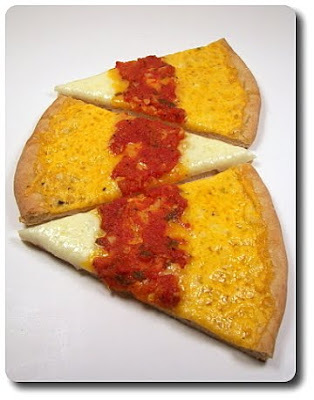 You know that Friday is pizza night around here, but this time Jeff had a request that we dig back through our files and make one we first did back in July '08 - just before we decided to do this as a weekly gig. I already had a new recipe planned out, but luckily I hadn't pick up the ingredients just yet. 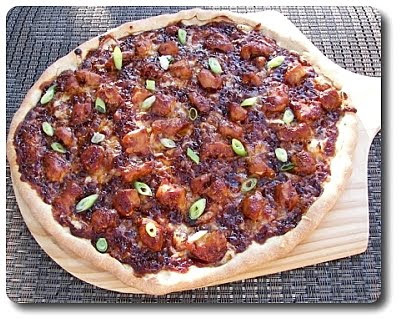 The new recipe has been shifted to next week, leaving tonight open to make the Malaysian Chicken Pizza he was asking for. I didn't bother with a new picture, but here's a snap from last time to refresh your memory! He made a good choice for a repeat dish - this was just as good as we both remembered! 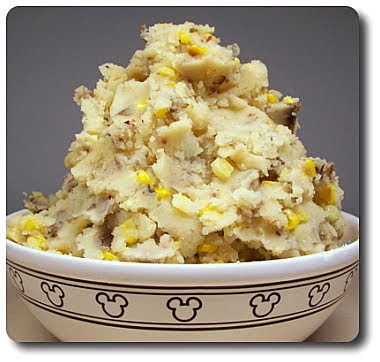 Before we left for Disney, we made these Chipotle-Corn Mashed Potatoes as a side to dinner one night, but I just never found the time to get them posted! Better late than never - right? Shucked ears of corn, rubbed lightly with a bit of oil, were set over the grates on the grill and left to cook, turned often of course, until most of the kernels had taken on a light golden hue with a few scattered dark spots for the most flavor. Removed and set aside to cool until I could hold them (without dancing around because they were still too hot - oops! ), we sliced the kernels off and set them aside to be used in a bit. While that was off working, chunks of russet potatoes were placed in one of our largest pots and covered with enough water that all of them were submerged. You do want to season the water at this point - I don't measure when adding it to potato (or pasta) cooking water, but you don't want to be skimpy... a few healthy pinches is usually enough. When they had come to a fierce bubble and cooked through until tender, we drained away the water, but put the potatoes right back into the empty pot. We do this, with the pot set of low heat, to evaporate any of the excess liquids hiding with the potatoes so they end up fluffy and light. While that is one tip we always use when doing mashed potatoes, another one we follow is heating the milk and butter a bit before tossing them in. If you use cold milk and cold butter, they will eventually warm up and melt into the mix, but then you'll be left with cold potatoes. We've just found that warming them first helps the whole mix blend well and stay warm. We leave the skins on for the nutritional boost, and frankly, we just like them, but it is best if you then just mash them with a potato masher and keep them a little coarse. If you prefer your potatoes to be silky smooth, you'll want the peels off and use a potato ricer or mixer to whip them together. When they are at the texture you like, the roasted corn is folded in, along with minced chipotle chiles and a little of the adobo sauce they are canned with. 2 chiles were just right for us, giving us the heat we crave, without making us sweat, but a single chile or even just some of the adobo sauce would be good for the smoky edge without the bite. Made as is, we got a generous 10 servings - way too much for us, but we froze a few servings and found they reheated up quite well! Unless you're serving a crowd, or love leftovers like we do, this recipe is one that would work just as well using half the amounts to pare it down. 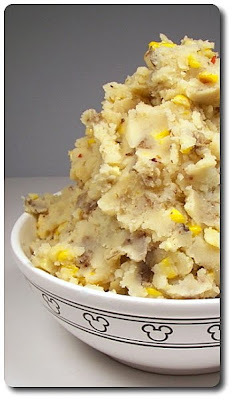 If you're a person who never let their corn touch the mashed potatoes on their plate, then this might not be for you... but if you swirled them together, don't let this pass you by! Well, even if you like your foods separate (Jeff and I both used to do that growing up), you may want to give this a try anyway - you just might surprise yourself! Depending on where you are, you might be out of luck to find good, fresh corn in your market. If that happens, you could trying using thawed frozen corn kernels - try spreading them out on a sheet pan and placing them under the broiler to give them a bit of color for a similar (but not quite as exciting) taste. I don't have a ton of experience cooking ethnic cuisine, though we are trying to incorporate it a bit more, which means I can't claim just how authentic recipes are when they fall into that realm. I do enjoy the process of trying them, if for no other reason than it pushes us and expands what we are willing to try, especially during the times we travel and are eating at restaurants. It gives us a small idea of what to expect at least! 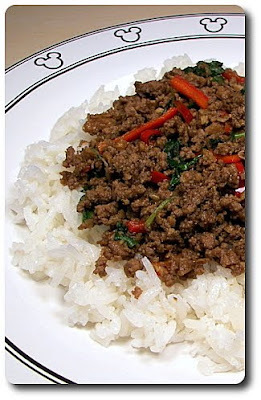 Just like this Thai Beef with Chiles and Basil Over Coconut Rice we had for dinner tonight - I wouldn't know for certain if it was more of a technique or if the combination of ingredients is what made this recipe be labeled "Thai". It could also be overzealous labeling to make it sound fancy or complicated too... hee hee! 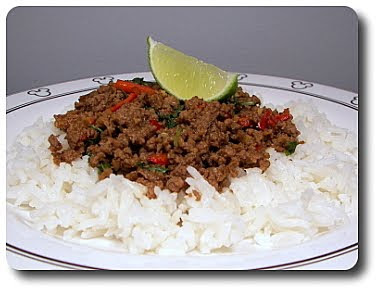 While the coconut rice follows the beef in the recipe title, we needed to get working on that before we started on the protein. You know how much of a fan I am of using the pasta method to cook rice (especially brown), however as this recipe calls for using coconut milk, cut with water, we went with the regular absorption method. There isn't anything to be scared about using this way to cook the rice though - the key I've found is to keep the temperature low enough that the rice has time to cook, yet not too high that the bottom dries out and burns. While the original recipe calls for cooking the aromatic jasmine rice on the heat for 25 minutes, I find we get better results, as we did tonight, by leaving the pot over the heat for 20 minutes, then turning the heat off and letting it sit, covered, for an extra ten minutes to gently steam the rice through. A few red jalapeños, seeded and sliced into sticks, along with chopped garlic went into our trusty heated cast-iron skillet that was lined with just enough oil to cover the bottom. Just a few seconds later, their pungent aromas climbed up to my nose, letting me know it was time to slide in our protein of choice this evening, ground sirloin - however, think about using ground lamb, turkey or pork instead to look at this with a new light. Once you scatter the meat in the pan, try to resist diving right in with a spatula to break up the meat into crumbles. Since the skillet is pretty hot, give the meat a chance to actually begin to caramelize and gain that brown color, rather than smashing the juices out trying to get it into smaller pieces and end up with stewed meat with little developed flavor. A combo of soy, fish sauce and a dash of sugar is then stirred into the mix to not only season the meat, but add some liquid to pull up any of those sought-after browned bits that stuck to the pan. We reserved a few of those jalapeño sticks and stirred them in at the end, along with a fistful of torn fresh basil. Scooped over a bed of the coconut rice, don't forget to add a wedge of lime on the side for each guest to squeeze a little tart note on top just before eating. I wouldn't say Jeff was jumping for joy when he saw me bring out the can of coconut milk for this dish - it's not that he dislikes coconut, but for him, especially with the milk, he feels it can often overwhelm. Using it with the floral rice though seemed to strike a delicate balance and he quite enjoyed the fluffy combo! Neither of us found the juicy beef mixture overly spicy, but the flavor from the chiles was noticed and nice - however, I think we could have gotten away with leaving the seeds with one of the chiles to jack in a little extra bite! I'm sure you can imagine after picking all those apples, this week's Wednesday Treat Day would work at least a couple of them in! 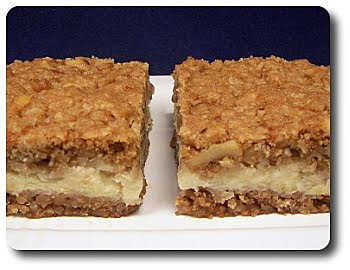 I rummaged through the humongous box in the garage to figure out what two apples to use in these Sour Cream Apple Bars and ended up pulling out Honey Crisp and Golden Delicious. To give us a firm, solid layer to hold up to the creamy filling, we started with a mass of creamed butter and rich brown sugar, into which we mixed in oats, flour, chopped walnuts, baking soda, cinnamon and just a touch of allspice for a rounded aroma. I used quick-cooking oats as I had them on hand, but you could use the thicker, old-fashioned rolled oats if you like - you may just want to blitz them once or twice in a food processor or blender to break them down a bit. Walnuts can just be tossed in naked and chopped, but do yourself a favor - toast the nutty nuggets for a few minutes. Toasting pulls the natural oils to the surface and intensifies their flavor while also crisping them up for an increased crunch. We took about half of the crumbly mixture and placed it in the baking pan, pressing it down to create the crust. Before the filling can go on though, we needed to give the crust a head start, resulting in a golden color and building the structure of the bottom. You'll be wanting to put the filling on as soon as the crust comes out from the oven, but you may be surprised with just how simple it is. The filling is composed of 5 ingredients - sour cream, granulated sugar (use vanilla sugar if you have some stewing in the pantry! 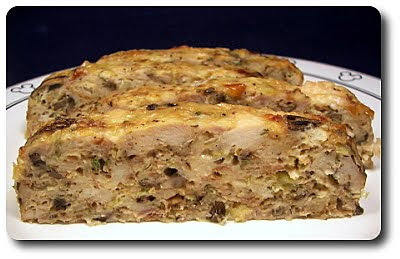 ), a couple spoonfuls of flour, an egg and two shredded apples. You can peel them if you must, but you really don't need to bother wasting time with that - we left them on because the flecks of color was nice and the peel would soften enough that it would not become obtrusive texturally. 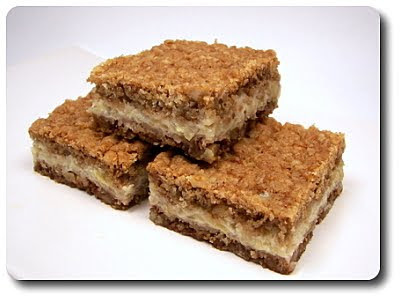 As we only used half of the oat crumble on the bottom, after we scooped the filling onto the hot base, we sprinkled the rest of the fragrant crust mixture over the top to create these layered bars. Since you can't really use a toothpick to check for doneness, the best way to tell when to take them out is by sight - the top should be evenly golden and the center should feel and look set. 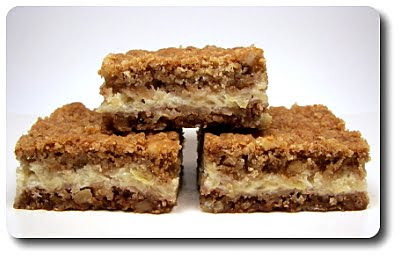 Sandwiched between two oat-y cookie layers, the filling of these bars is tangy, with a gentle sweetness, which we found to be somewhat akin to soft cheesecake. Because of those toasted nuts and warm spices in the crust, the mixture comes across more than just a buttery encasement - it had depth and crunch, yet wasn't tough or overpowering - meaning it did its job without overs-shadowing the more delicate apple filling! Tonight's dinner happened to be made in a springform pan and does have cake in the title, but let me assure you it is far from dessert! Even though this wasn't a sweet treat, I'd still label this Baked Rigatoni Cake as a show stopper and makes for one dramatic presentation! You'll need a pound of ground meat to get the sauce started - be it beef, pork, chicken or turkey... even a mix of those would be good. Because this is going to be fairly heavy with the pasta and cheeses, I went the lighter route by using turkey, but I decided on a combo of ground turkey and hot Italian turkey sausage to juice up the mix. 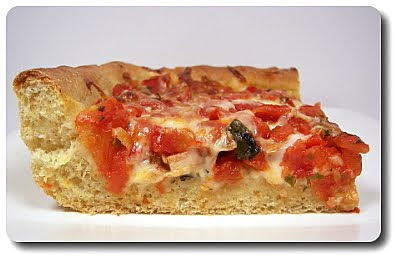 Browned in a slick of oil, we tossed in a couple cloves of garlic and a mess of fire-roasted crushed tomatoes. Brought up to boil to get the process started, the heat was then lowered to a bare simmer and we let the pot bubble away until the sauce had thickened. While that was happening, I used the downtime to drizzle a pound of rigatoni, that we cooked and cooled down, with olive oil, then tossed it around with a generous shower of fresh grated Parmesan cheese. Those coated tubes were then packed into the mentioned springform as tightly as possible, standing each on their flat side, taking care not to collapse any of them. 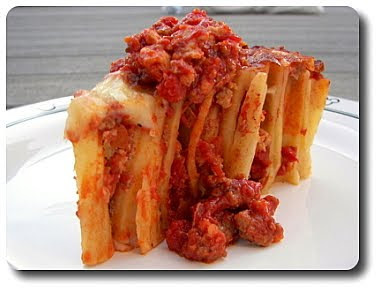 You want the tubes open and waiting because we're about to take a couple cups worth of the meat sauce we prepared and slather it all over the top, using lots of pressure to fill up the centers of the rigatoni! You don't need to try and push all of sauce in, just use the amount called for - yes, you'll have some leftover, but don't worry, we'll be using it later! 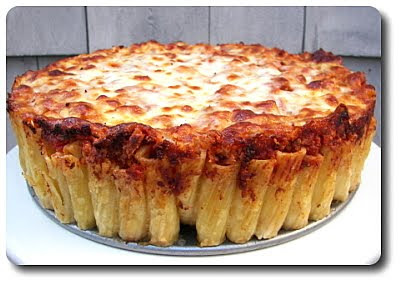 About halfway through the total time needed to bake this pasta cake, we took out the springform pan and concealed the sauce on top by scattering over coarse shreds of mozzarella cheese. Bake again to melt and brown the cheese. Plan on giving this at least 15 minutes to cool down before you try and serve - this will give the dish time to set, allowing you to remove the sides of the pan and pull out tidy pieces that don't fall apart. 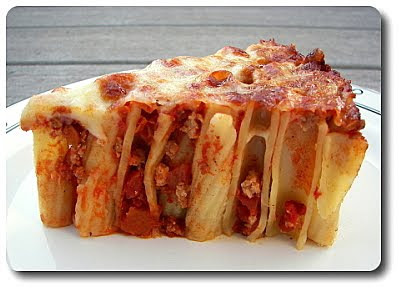 Besides the fact that this won us over on taste alone, taking the entire piece to the table and having the "wow" factor of cutting it to serve, with that layer of gooey cheese on top, was worth making this dish by itself! I do have a couple notes on the sauce - it is fairly mild and did end up being fine as the hot Italian turkey sausage did wonders for the background. However, I do think it could easily be tinkered with - crushed red pepper, a little red wine and throwing in basil, oregano or your favorite marinara seasonings would help to add a little pizazz. I didn't forget about that leftover sauce either... warm that sucker right back up and serve it over the top! 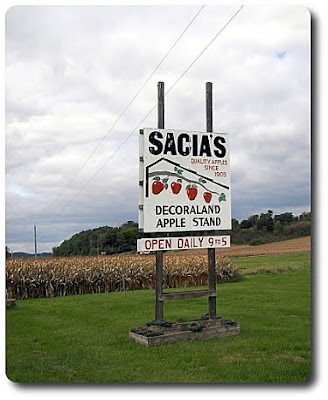 When we travel down to pick apples with my family, I try to bring along a treat to share when we are off driving around trying to get to our next destination. One year it was those Lemony Almond bars and another time we brought a batch of those Chocolate Malted M&M Cookies. 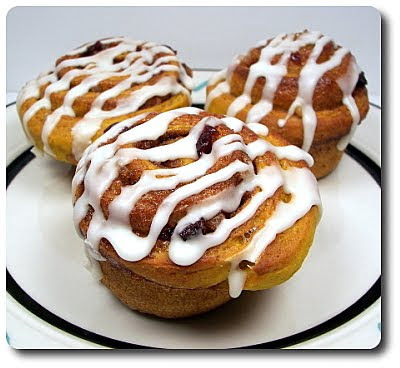 With this trip, I decided on these Cinnamon-Swirl Pumpkin Rolls! I was actually planning on doing just your ordinary cinnamon rolls, but when I saw PJ post about these pumpkin rolls, they were was too tempting to pass up! While you can certainly prepare this dough by hand as you would any other bread dough, I put our stand-mixer to work as I was busy working on another project at the same time. The best part about that was all of the dough ingredients were just dumped into the bowl and brought together using the paddle attachment. You should note we used white whole-wheat flour as a part of the dry ingredients for its nutrition boost - if you don't want to buy that, you can either use completely all-purpose or even regular whole wheat flour. If you use the latter, expect the rolls to be a little more dense. As soon as the dough started to come together, I swapped the paddle for the dough hook and let it go until the dough was soft, supple and smooth. It is (and should be) on the sticker side, another bonus for using the stand mixer, and the dough will cling to the bottom of the bowl - however, it shouldn't be so wet that the dough doesn't hold its shape. Don't be afraid to adjust with water or flour as needed. Left to rise until it had doubled in bulk, we turned the dough out onto our work surface and let it rest briefly before rolling it out into a large rectangle. You can dust the surface with flour to keep it from sticking if you wish, but because we didn't want to keep the rolls light and not add any more flour, we simply sprayed our counter with cooking spray - try it, it works well! The original recipe did call for a purchased filling mix, but it wasn't needed as a combo of granulated sugar and a liberal amount of fragrant cinnamon did the trick. To give the filling a unique twist, on top of that sweet bed of sugar, we scattered over chopped dried cranberries, along with a handful of minced crystallized ginger for zing. Back to the original recipe, PJ rolled the log starting at the short end to end up with just a few big, fat cinnamon rolls. I wanted to stretch a few extra rolls out a bit, so we rolled the log up using the long side of the rectangle as our starting point. You can use a serrated knife to divvy the log up, but plain, unflavored dental floss works like a dream... just like a hot knife through butter! If you've never used it before, slide the floss under the log, crisscross the thread over the dough and pull the ends firmly to cut through - easy and no squishing of the dough! I still ended up with twelve rolls that were plenty large - instead of baking them all together in a baking dish, I placed the rolls snugly in the wells of a muffin tin. They do need to rest once more before being baked, but the good news it it doesn't take quite as long as the first rise! Baked until the rolls pop up and brown, we took them out and let them cool off completely before drizzling on a smashing glaze made from confectioners' sugar, butter and milk. I waited for these spiral gems to cool because I wanted the striking contrast between the rolls and the glaze, but if you like, drizzle the rolls while they are still warm and it will slowly melt in. Besides adding a subtle pumpkin flavor, that orange mash gave these rolls a moist, tender quality that we noticed right off the bat. I didn't mention it in the beginning, but the dough did flirt with a few spices in the dry ingredients to add to the richness - cinnamon, ginger and a touch of ground cloves were the ones we went with. You don't have to add the cranberries and crystallized ginger, but we thought the tangy, sweet heat those two wiggled in were just the right notes to play off the pumpkin essence in these rolls. 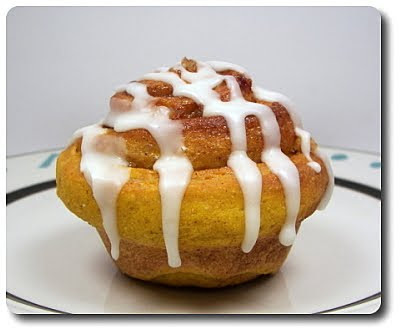 Now, I'm one who unravels cinnamon rolls and eats them from the outside in, while Jeff decimates them by taking out big bites - how do you eat yours? Today brings us to yet another weekly Friday Pizza night and guess what? I didn't bust out our snazzy whole-wheat pizza dough! Yeah, yeah... I know I almost always fall back to it regardless of the recipe, but this time we stuck with what was called for because we needed a greater volume of dough and this one included a special ingredient! 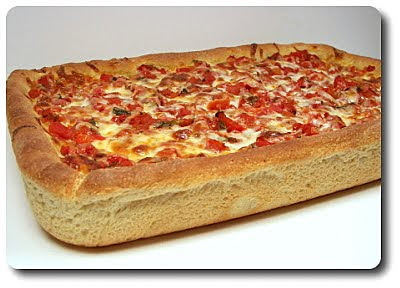 With this Deep-Dish Pizza we were making, the dough is actually very straightforward to prepare with just flour, yeast, a dash of sugar, salt, water and a bit of oil as the ingredients . However, what made this dough a little different was the inclusion of cornmeal to try and recreate texture without the need of excessive amounts of oil later on. You could probably use your food processor, just like our other favorite dough, but I didn't feel like cleaning the machine up and just went with my hands. When the dough had risen sufficiently, we punched it down, gave it a quick respite to relax and then rolled it out to a size a bit larger than the baking dish we were using. Now, normally with deep-dish pizza, one would oil the pan the dough was going to be heading in generously, giving it flavor and a crackly crispness to the outside. As this is a lighter recipe, the recipe calls for using that cornmeal in the crust to give you a little crunch, then only used cooking spray on the baking dish to keep things moving. You could still do that, but what we ended up doing was drizzling in a rough tablespoon of oil into the dish and smeared it around - this way we aimed to get the best of both worlds, yet not add too many extra calories. 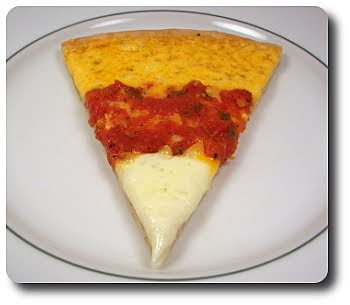 Once we fitted the dough snugly in the dish, paying careful attention to ensure the dough was plenty high up on the sides, we seasoned the bottom with dried basil and oregano, then scattered with plenty of shredded mozzarella cheese. No sauce first? 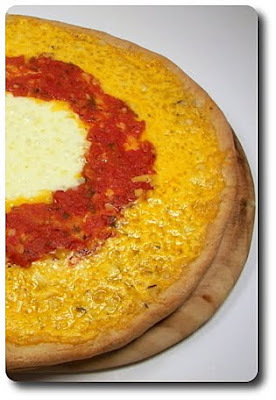 Nope, not on this type of pizza - you want most of the cheese underneath because of the length of time it takes to bake the crust through. 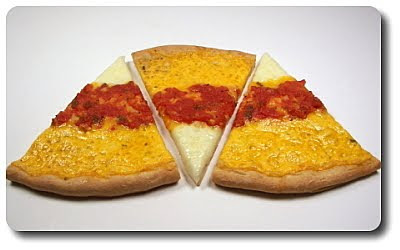 This way you'll end up with a gooey layer of cheese underneath that slowly oozes as you slice into it. Then, on top of that mess of cheese, we scattered over chunky cubes of chicken sausage. While we set that aside to rest and rise a bit, we chopped up a can of drained whole tomatoes and mixed into them fresh basil and oregano to echo what we put on top of the dough. This mixture is then left to continue draining (we don't want a soggy top!) 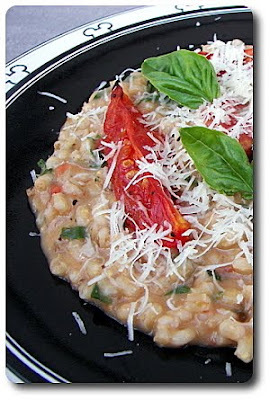 while the oven was busy preheating and we softened the red bell peppers we were going to add. The original recipe called for mushrooms, but once again, Jeff saw me try and hide them in the shopping buggy and snatched them out when I wasn't looking. Sigh. See what I have to put up with? If you don't have that problem, sauté up a couple cups of sliced mushrooms first, then add the peppers and let them go. A couple other suggestions - if you have a hankerin' for green bell peppers (neither of us care for them), swap half of the red bells for those. If chicken sausages don't strike your fancy, then go with good ol' pepperoni instead - or, just leave them off for a veggie-friendly pizza! Just to add some pizazz, after spooning the herbed tomato and cooked vegetables over the top, a little more mozzarella sprinkle over never hurt anyone, so on it went! 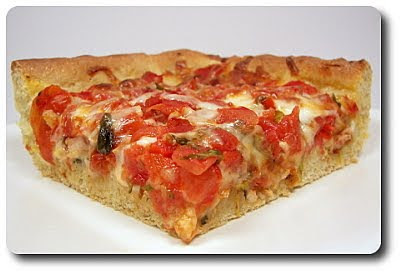 This took just short of half an hour to completely cook the crust through and warm those toppings up. Slice it in the pan if you like, but one can make a more dramatic presentation by moving the whole shebang out onto a cutting board - don't worry, it just slides right out! The golden crust was hefty enough to hold up to all those ingredients on top, but we didn't find it too bread-y, except maybe the corners that ended up pretty beefy. The bottom of the crust retained some crunch as advertised (helped by the oil we added I would guess), but do realize it won't be as lush and rich as one gets from their local pizza joint. We sliced this into six liberal squares, but really, eight probably would have been more appropriate as we ended up pretty stuffed! I think the only thing I would have done differently would be to mix in a bit of crushed red pepper into the tomatoes for a little kick. I was determined to work a soup into the menu this week, but had a hard time narrowing it down to a recipe... that is, until Jeff came by, saw one of the options had pepperoni and declared it the winner. I guess I should have just asked for his input to begin with because he definitely picked a winner in this Minestrone with Endive and Pepperoni. Stirring a bit of chopped red bell pepper, or any sweet bell color you like, around in our Dutch oven was where I turned attention first to start bringing this soup to life. Broth, of the beefy variety, was poured in when the peppers had softened, with dried oregano and thyme added for good measure. When the broth had come up to a rapid bubble, elbow pasta was stirred in (I used this multi-grain pasta for those wondering) and left to cook until it was a few minutes short of actually being done. Besides being a soup, what else attracted me to this was how fast it could be thrown together, especially since it called for using frozen mixed soup vegetables - we found a bag that had potatoes, carrots, celery and onion. Of course, one could certainly use fresh vegetables with a little extra work - just add the carrots, celery and onion as you normally would in the beginning. Then, either par-boil the potatoes separately and add them when called for, or toss them into the broth to cook before you add the pasta. The original recipe also called for frozen baby lima beans, but we swapped in edamame instead as we already had some in the freezer. When the vegetables had almost cooked through, fire-roasted diced tomatoes were brought into play, along with diced pepperoni (Jeff did a little cheer as they went in!) and coarsely chopped endive for a little green boost. Chard would also work well here, just be sure to pull away the tougher stems. Just before serving, give the soup a quick taste - you'll most likely want to hold off on adding more salt (more on that in a second), but plenty of fresh ground black pepper is definitely appropriate. 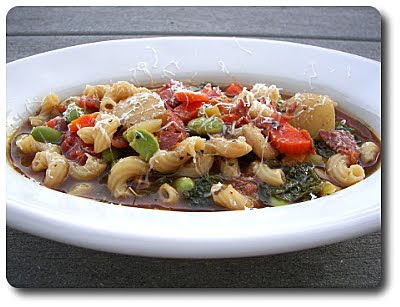 With the broth and pepperoni seasoning this minestrone with a salty edge, right before we dug in, we took a knob from our block of Parmesan cheese and showered each bowl with just enough to compliment (hence why we held back on adding even more salt.). With a decent ratio of broth to vegetables and pasta, we found this to be very filling and it definitely warmed our stomachs up on this chilly fall evening. Pepperoni isn't what one might necessarily expect to find in this type of dish (at least I didn't think so), but it brought a mild spice that we both thought perked up the soup. Rather than just having a bowl of spaghetti and sauce for dinner, why not spruce it up and take the noodles for a spin in a different direction? 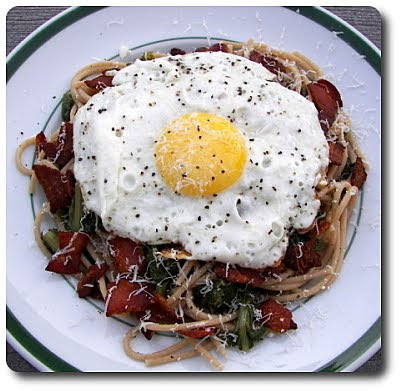 That's what we did with this Spaghetti with Frisée and Fried Egg we prepared this evening. As we dropped the pasta, our knife went to work slashing a few strips of bacon into pieces, then tossing them in a skillet to start rendering out. As we used a good amount of bacon, it produced plenty of drippings as they cooked - halfway through, we took the time to drain away most of the excess fat and reserved it for later use. Why let it go to waste? Wicked and probably a little naughty for sure, but you'll see in a minute what we did with that crazy liquid. Besides, we did our good deed by using healthy whole-wheat pasta, right? Hee hee! After taking the now-crispy bits of salty bacon out of the skillet, we quickly followed up with a hefty amount of chopped, slightly bitter greens, frisée to be exact. Just as it began to wilt, we shocked it with a shot of sherry vinegar to envelop the greens with a sharp note. Scooped into a bowl with the drained pasta and a scoop of the starchy water it cooked in, we used the same skillet for the third time (hurray for less dishes!) to work on the last touch for this dish. Pouring in enough of the reserved crazy liquid, aka bacon fat, to cover the skillet and heat back up, we then cracked in a couple eggs to fry. Sizzle the eggs to your liking, but for us, I let them cook until the whites had just set, the edges were ever-so-crispy and lightly golden, yet the yolks retained a silky softness that when pierced with a fork, let loose a golden flow of decadence. 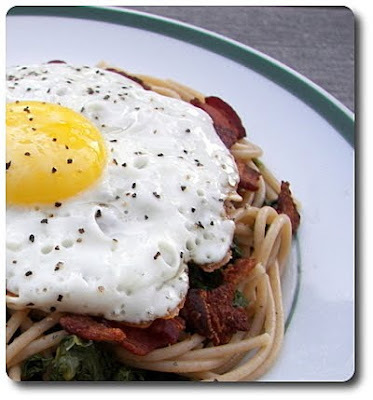 Twirling the noddles, strewn with the tender greens, into a nest on the plate, scattering the top with bacon and sliding the fried egg on top, one would think we'd be set to eat, yes? Not so... since we'd already started down a slippery slope with all that bacon, we figured we might as well throw caution to the wind and top off the plate with freshly grated shreds from a quality block of Parmesan cheese. On the plate in just about 20 minutes, this is one of those simple, yet satisfying dishes I will definitely keep handy for those nights when we have a house showing or errands that keep me out of the kitchen. Maybe not as often as both of us would like, but it won't be long before this graces our table again! Since we did an apple treat last week, we thought we would keep the fall theme going and follow up with these Pumpkin-Swirl Brownies for the Weekly Wednesday Treat Day! These brownies were not so much of a challenge to make, but there are a few somewhat messy steps to get the batter in the pan and ready to bake. Starting out with a single base, made from flour, sugar, eggs, vanilla and baking powder, the fairly fat-less batter is divided between two bowls to get gussied up. Oh, there was one more ingredient, but I'll wait (unless you cheat and jump to the recipe!) to divulge what that was... sneaky, I know! But you'll like it! Into one of the bowls, we gingerly stirred in a decadent melted duo of bittersweet chocolate and butter. I know, one whole, buttery stick... but these are brownies - resist trying to lighten with applesauce! With that pale batter transformed to a dark, delicious pool, the other bowl was given a shock of color with mashed pumpkin, along with a smidge of canola oil. With all that pumpkin added, this one needed a couple spices to accentuate the sweetness - cinnamon and a few fresh grates from one of the whole nutmegs we have in the pantry did the trick. Add a half cup of chopped, toasted nuts if you like, but we left them out of this batch. The two batters are then alternately layered into the baking pan, so you'll end up with 4 total, into which you'll stick a knife to swirl them together creating a lovely marbled effect. I do have one tip - once the batters are combined, work as quickly as you can to get them layered into the pan and swirled. The pumpkin batter was fine, but the chocolate will start to firm and set if you wait too long. Use a trusty wooden skewer or toothpick to test for doneless - you'll want to take them out when there isn't any wet batter left, but there are still sticky crumbs to be found. If it are passed that point, they won't be bad, they just will be a bit more cake-y. 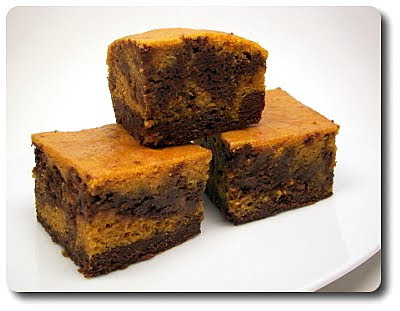 While I wouldn't classify them as cake-style brownies myself, I don't think they quite fit into the fudgy mold either. 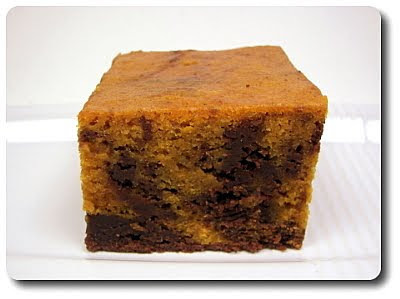 When I think of describing them, dense, rich and moist come to mind, along with a nice chew that rounds out the texture. We also noted a slight tingle coming up our throats after a couple bites... remember that special ingredient I was holding back? It's cayenne pepper! Not much, a puny quarter teaspoon, which one probably couldn't point out as it doesn't scream its existence. 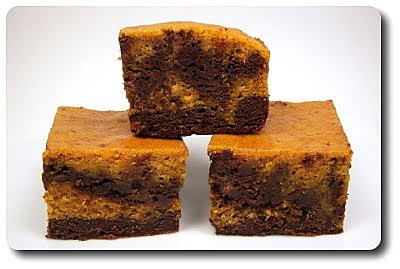 However, we liked the complexity it added to these brownies. 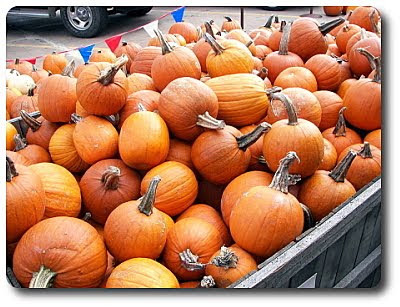 I wondered how prevalent the pumpkin would come across - it was definitely there, highlighted by those warm spices, but it played with the chocolate well enough to come across as a complete package without one competing with the other. Brrr! 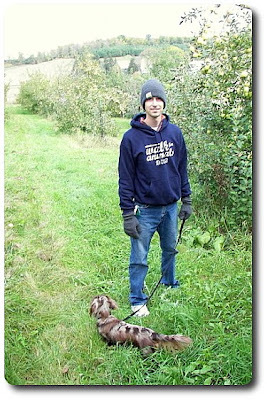 It was a cold, blustery trip yesterday, but Jeff, Gus and I bundled up and drove down to join my family at our meet-up spot in Winona to do our annual apple picking trip! The first trip we talked about on the blog, you'll notice that we were in shorts. This year? I'll let this picture do the talking. That would be three layers up top, two pairs of socks (with one of them being wool...) and gloves to try and keep me warm, and I was still bouncing all around trying not to freeze (I get cold so easy!). Lucky for Gus, he has all that long hair to keep him toasty! 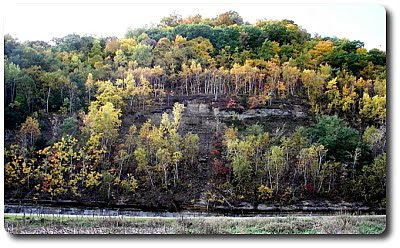 Depending on where exactly we go, we tend to travel back and fourth, weaving in and out of Minnesota and Wisconsin. 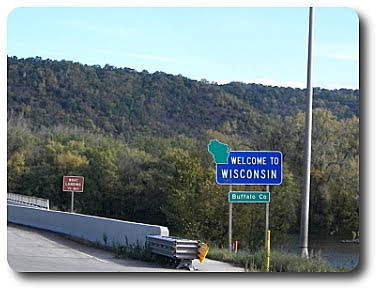 Here we enter Wisconsin for the first time, just outside of Winona. Jeff was playing with the camera and I'm sure this will be no surprise to you that we have this hanging in the car. 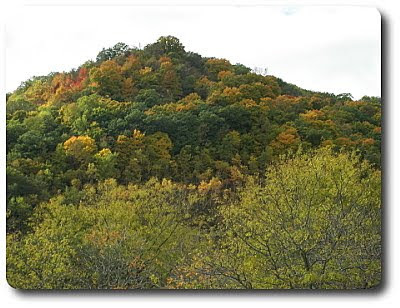 Our first stop is always to the hilly Decoraland, which is where we do most of our picking. See? One stop shopping! It's a small list compared to the variety of trees they actually have to choose from. 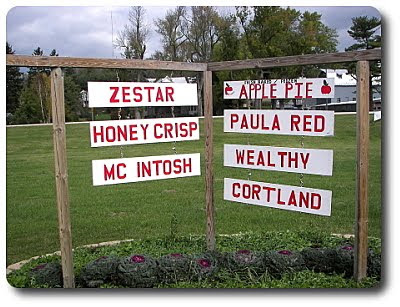 We put our hands to use and snatched off Golden Delicious, Fireside, Zestar and of course, the ever sweet and crispy Honey Crisp. I can't believe how much we ended up with - 68 pounds! Those darn bushels fill up so fast. Now we just have to figure out what to do with them all - any suggestions? Besides going for apples, the other reason we go to this area is simply all about gawking at the absolutely stunning scenery... though, sadly, this year the colors were quite muted compared to other trips. That doesn't mean it wasn't still beautiful (note the trees growing out from the rocks!). 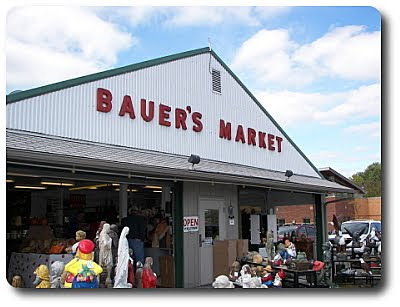 The little markets and shops along the way are what really make the trip special - here's one we never miss. 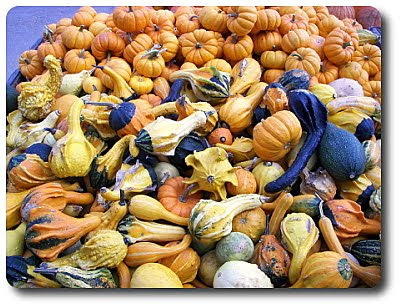 All shapes and sizes, along with funky gourds one would expect to find! 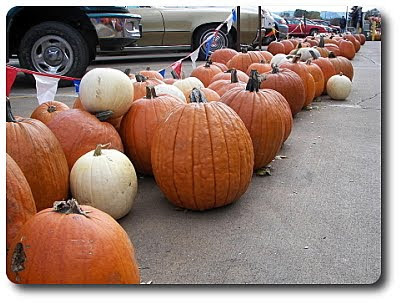 They also had loads of pie pumpkins, just aching to be cooked and mashed for the first pumpkin pie of the season! And yes, the kitchy Halloween displays were ever-present... here's just a snap of the many! 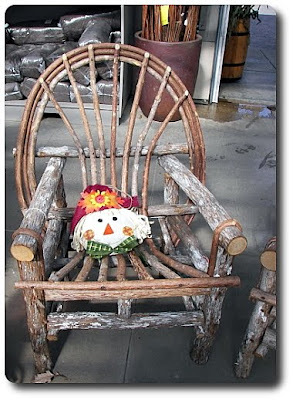 This is from a set of furniture made right from twigs and logs -Mom especially took her time snooping around this area to try and figure out how to make them herself! We stopped at a few other spots, but we were too enthralled with the offerings that we got caught up and left the camera in the car. What a great way to spend the day - we can't wait until next year's jaunt!